Check your emails if you're on the Mccain newsletter mailing list! 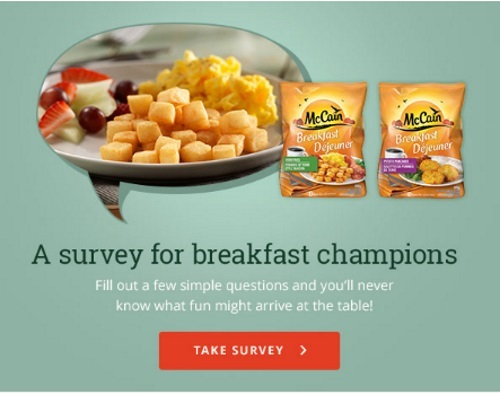 In the email there is a survey, if you complete the survey you'll get a coupon free bag of McCain breakfast potatoes! This offer is available for a limited time only, May 26-June 9 2016. Only McCain Canada email subscribers as of May 26th, 2016 at 9:00AM EST are eligible for a coupon. Only one coupon per household. Coupons will be mailed out within seven to ten business days. Click here to sign up for future coupon offers with McCain.